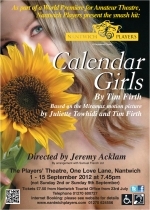 As part of a World PremiÃ¨re for Amateur Theatre, Nantwich Players present the smash hit Calendar Girls. Based on the Miramax motion picture by Juliette Towhidi and Tim Firth, this smash hit about a group of extraordinary women who pose for a charity calendar is an aspiring and entertaining story which touches the heart with hilarity and home truths. Nantwich Players are proud to present this play for an extended run, at the very first opportunity for amateurs to perform it.